He was such a gem of a man. Monsieur Fernand Chambrette. A gentleman of small stature, big heart, giant talents and not a small dose of the devilish imp that will be so greatly missed by those who knew and loved him, and certainly those who learned from him. La Varenne became something of a second career for Chambrette, an apt way to continue sharing his talents. Though he never played at the image of French cuisine being fussy or pretentious. The chef ribbed anyone and everyone, short of Anne Willan and her husband Mark Cherniavsky (at least I never caught him doing so!). And he loved to shock and provoke. Rather than delicately dip the tip of a finger into a saucepan to check the seasoning of a sauce, he’d dunk 2 digits a couple inches into the pot and pop them in his mouth to sample. And I swear I once saw him spit into a skillet to check if it was hot enough…. I remember one very ruddy morning at the school in Paris. Having completed my stagiaire program (rather like work-study), I was a full-fledged student for a six-week course. Some random excuse provoked late-night drinking with pals the night before, I was in a delicate, fuzzy state–which I think Chambrette surmised the second he laid eyes on me. The eight or ten of us sat down around the work block and, without speaking a word, the chef picked up one of those live eels and a heavy meat hook. I swear he stared straight at me the whole time as he proceeded to skin the thing (sparing you all the gory details), testing my bleary-eyed stamina for such things. Chambrette had all the French classics securely under his belt, no doubt about it. Seafood vol au vent, bien sûr. A beautiful vegetable terrine layered with veal mousseline. Croquembouche. You name it. But he was not the least elitist about culinary repertoire. He’d be just as happy, as Anne points out in Paris Kitchen, creating something delicious from bits and pieces of vegetables and leftovers in the refrigerator as he would be tackling a beef tenderloin. Happier, probably. I have Chambrette to thank for my confidence and delight in making many things, not the least of which is tarte tatin, the decadent upside down tart made with deeply caramelized apples. (A long overdue blog post about that is in the works, I even have step-by-step shots ready to go!). And I can still hear him telling the class about how he felt that “les Goldens” were one of the best apples to use for that recipe. Not a beloved French heirloom variety the likes of Calville Blanc d’Hiver or Reine de Reinette. But the humble Golden Delicious apple. It was a lesson in things culinary and otherwise. I came along to La Varenne in 1989, about a year before the school closed its doors in Paris, at which point operations continued at Château du Feÿ down in Burgundy. For several years, Chambrette would hop the train at Gare de Lyon now and then , making the trip to the château to teach classes. It was always a treat to have him at the château for a few days, but it was clear that château living was not his style. He always insisted on staying in the smallest room over near the student kitchen, the tiny chambrette (little room) that seemed to fit him to a T, literally and figuratively. And any time we couldn’t find Chambrette, sure money was on him having sauntered down to the guardian’s home at the end of the drive. He’d be visiting with Monsieur and Madame Milbert at their rickety little table in the kitchen, sipping Monsieur Milbert’s homemade calvados and talking about the garden and weather and surely gossiping about all the nutty Americans and English and Australians they find themselves surrounded by. Far more his speed than sitting in the grand salon of the château, chitter-chatting with students and guests over after-dinner coffee and digestifs. 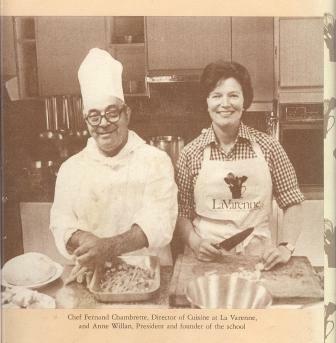 I was happy to keep in touch with Chambrette over the years after I left La Varenne in 1991. We’d exchange Christmas cards (written by Madame Chambrette, of course!) 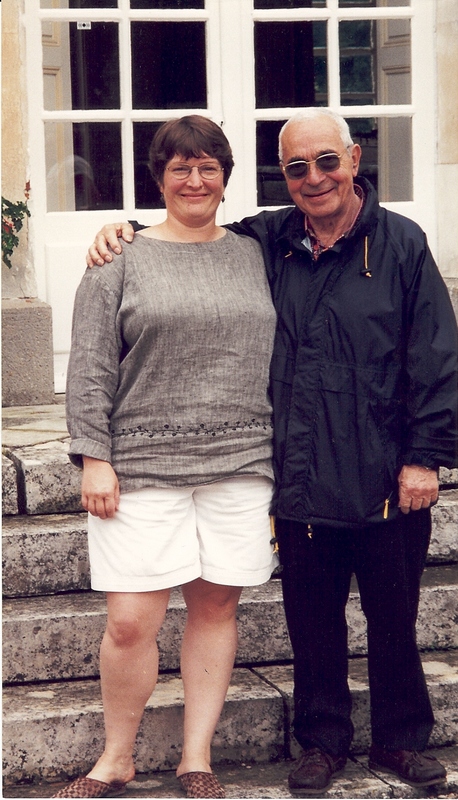 and I visited him a few times in Paris on future visits. Outside of the classroom, away from teaching and being “on” with students, he was such a relaxed, mellow character. It’s almost hard to imagine–sitting in his living room sipping tea–that teaching suited him so well. But it did. And I count myself a thousand times lucky that I was able to spend some phenomenal hours in his presence. As noted on a string of email from friends telling of his death this week, “it’s the end of an era.” Indeed it is. I had the pleasure of studying under Chef Chambrette in 1986 all be it only a week, at La Varenne, Chateau Du Fey in Burgundy, France. He was just larger than life and I was in awe of his presence. As I go through my day, I pass on tips endowed to me from him to my students. I got the nickname “profiterol Queen” thanks to his tips! The world was a better place thanks to Chef Chambrette. Rest in peace. How nice to hear from you Pamela, a treat to connect long-distance with a fellow La Varenner who was fortunate enough to learn from Chef Chambrette. What a gem he was!